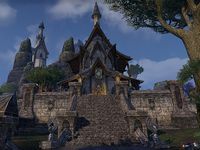 "Trechtus" was born in the early years of the Second Era in the Summerset Isles to serfs on the estate of a minor nobleman, Lord Gyrnasse of Sollicich-on-Ker. His father had secretly, against the law of Lord Gyrnasse, taught himself and then Trechtus to read. They had to rely on a black market to get around the restriction Gyrnasse put in place, but still managed to get a steady stream of books and scrolls. When Trechtus was eight, the smugglers were found and imprisoned. Some said that Trechtus's mother, an ignorant and religious woman fearful of her husband, was the betrayer of the smugglers, but there were other rumors as well. The trial of the smugglers was nonexistent, and the punishment swift. The body of Trechtus' father was kept hanging for weeks during the hottest summer Sollicich-on-Ker had seen in centuries. Three months later, Trechtus ran away, making it as far as Alinor, half-way across Summerset Isle. A band of troubadours found him nearly dead, curled up in a ditch by the side of the road. They nursed him to health, and employed him as an errand boy in return for food and shelter. One of the troubadours, a soothsayer named Heliand, who had trained as a mystic at Artaeum, recognized the boy's potential. When the troupe was performing in the village of Potansa on the far eastern end of Summerset, Heliand took Trechtus, then eleven, to Artaeum, where the Magister of the Isle, Iachesis, also recognized this potential and took Trechtus on as pupil, giving him the name of Vanus Galerion. Vanus Galerion and Mannimarco were the most brilliant students in Artaeum at the time. While Galerion used his talents wisely and honorably, being described as having a "light and warm" heart, Mannimarco turned to the dark arts and was slowly corrupted by them, being noted as having a "dark and cold" heart. Galerion was aware of his contemporary's transformation, and confronted Mannimarco; however, Mannimarco scoffed at Galerion's threats, and continued to study the dark arts. When the Psijic order sent Mannimarco to mainland Tamriel to run an errand, Galerion realized that the necromancer would use the opportunity to amass a following there. The masters ignored Galerion's warnings about the terror they were releasing on the rest of Tamriel, a mistake that Galerion would not soon forget. Eventually, Galerion confronted Mannimarco at Ceporah Tower, demanding that Mannimarco end his foul ways, but to no avail. After having many disagreements with the Psijics (though they were united in their hatred of necromancy), Galerion left Artaeum to pursue his dream: bringing the wondrous benefits of magic to the general public. When he began collecting magic-users from around Summerset Isle, Galerion attracted the animosity of all. He was operating out of the urban center of Firsthold, and there was a common (and not entirely unfounded) attitude that magical experiments should be conducted only in unpopulated areas. Even more provocatively, Galerion proposed to make magical items, potions, and even spells available to any member of the general public who could afford to pay. No longer was magic to be limited either to the aristocracy or intelligentsia. Some labeled Galerion's efforts "Galerion's Folly." In 2E 230, less than a year after leaving Psijics, Galerion was brought before Iachesis, the King of Firsthold, Rilis XII, and numerous nobles and members of the Psijic Order in the "Charter Conclave" to state the intentions of the fraternity he was forming. Galerion's speech to Rilis and Iachesis was not recorded for posterity, but his charter, at any rate, was approved. It proved to be extraordinarily successful, and Galerion himself would become very well-known for his wisdom. He's still cited as the authority on many magical concepts, such as trafficking with daedra, and the modern schools of magic were developed by him. He even outlawed the practice of necromancy within the Mages Guild, and classified the art of soul trapping into two categories: the legal, "White" souls comprised of lesser essences such as beasts and animals, and illegal "Black" souls derived from sentient beings. Galerion believed that such soul-trapping was a part of a sinister plot by Mannimarco to make necromancy seem commonplace and harmless. He soon after formed the Order of the Lamp as protectors of the Guild. It is claimed Galerion departed from the Guild, angrily calling it "...a morass of political infighting", before departing Tamriel entirely. However, he still held the title of Archmagister Emeritus, and continued to influence the affairs of the Guild, including accounts that he continued to lead Mages Guild forces against Mannimarco's Worm Cult throughout his life. Following the Soulburst, Vanus Galerion became increasingly concerned about the activities of the Worm Cult and the looming threat of Molag Bal's Planemeld. In 2E 582, he and the Soulless One attempted to negotiate a cease-fire in the Alliance War, so that the three alliances could commit their full resources to an assault on Coldharbour. This negotiation was ultimately unsuccessful, but the alliances did endorse a smaller action, in which Mages Guild and Fighters Guild forces invaded Coldharbour to stop the Planemeld. During this invasion, Galerion was teleported outside the Black Forge of Coldharbour alone and attempted to disable it to help stop the Planemeld. 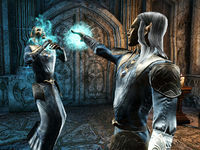 He was soon captured by the Daedra running it and utilized as a power source, where his essences were split from him. The Soulless One freed him, restored his essence, and journeyed with him when he personally destroyed the Great Shackle that was intended to bind Coldharbour and Nirn together. Returning to command his forces from the Hollow City, the guilds crossed the Chasm of Coldharbour but were met by the vampires of the Orchard. Vanus assisted in removing Molag Bal's control over them, allowing the guilds to pass through to the Reaver Citadel, which they captured to gain access to the Endless Stair. 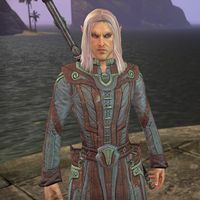 Then, along with the Soulless One, Darien Gautier, Laloriaran Dynar, and Meridia, he entered and disrupted a planar vortex that connected the two realms, ending the threat of the Planemeld. Around 2E 583, he enlisted the Soulless One to help free Oracle Marieve from Mephala during the Daedric War. And their power to me, and you shall live as befits the dead." The hollow laugh of Mannimarco answered: "You die first." At some point after the Planemeld,[UOL 1] Galerion headed north with an army of Mages and Lamp Knights to a cursed mountain path to settle his business with Mannimarco. Galerion and his army were met by an equally powerful army of necromancers on the mountain, and both sides were ready to do battle. As the two armies clashed, lightning and frost cascaded around them. The necromancers summoned various undead creatures to their sides which were battered by streams of light forged by the battlemages. Galerion noticed, before the end of the battle, that Mannimarco was no longer alive: he had turned himself into a lich, thus gaining immortality. For a long time Mannimarco was thought to have died in the battle. Although Galerion himself was killed, Mannimarco clung to his state of undeath, and the practice of necromancy would live on. Mannimarco's followers were either killed or scattered, and the triumphant army Galerion left behind secured his legacy and the legacy of the Mages Guild. In his never-ending lust for power, the undead Mannimarco began a tradition of killing, soul-trapping, and collecting the bodies of powerful wizards, most often arch-mages of the Guild, which he would then resurrect as zombified Worm Thralls to study. Galerion was one such Thrall, whom Mannimarco developed a particular fondness for. He was still in a state of undeath in 3E 433 when Mannimarco once again returned to the affairs of mortals. Many principles of magic are named after Galerion. In TES V: Skyrim, Wylandriah makes reference to "Galerion's Law of Casting". Ancotar's Journal mentions how "Galerion's Ninth Law" being immutable derailed a magical experiment attempting to spontaneously generate life. He also appeared in the book "I was Summoned by a Mortal," where he summons the book's author, Kynval Zzedenkathik, to fight against Worm Cultists, much to the Kynval's dismay. A statue of him appears in the city of Cheydinhal in TES IV: Oblivion. This page was last modified on 16 January 2019, at 00:41.